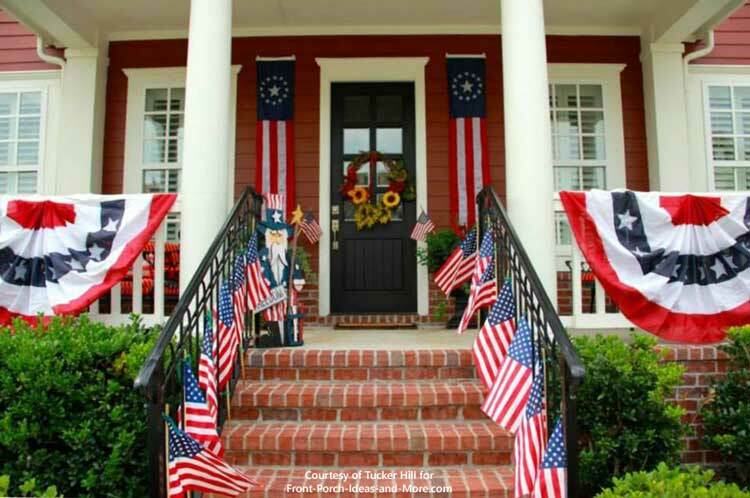 4th of July decorations are fun and if you decorate your front porch, you'll be the envy of your neighborhood! It's easy to do, doesn't have to cost a lot, the kids can help, and you'll have a great time. 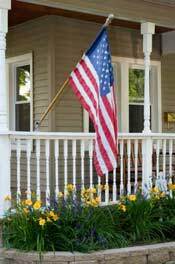 If nothing else, a beautiful flag on your porch shows your love for your country. 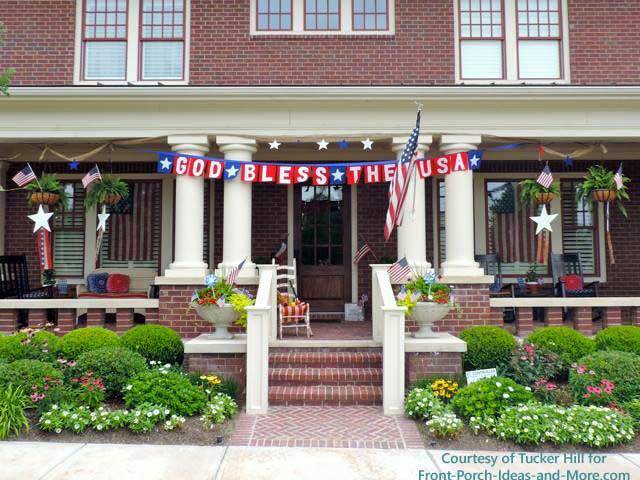 Dave and I are thrilled to show you some of the patriotic pictures from the Tucker Hill community in McKinney TX. 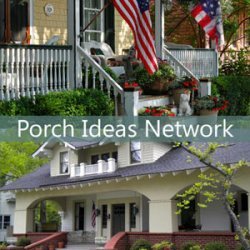 This is truly a porch lovers' neighborhood. 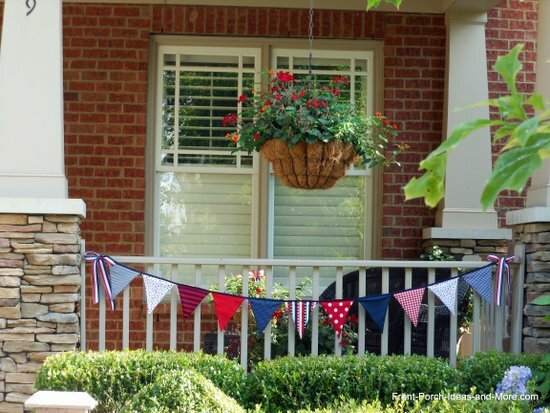 We love the festive feeling of this home with it's banners, flags and buntings. And do you see the Uncle Sam, too? 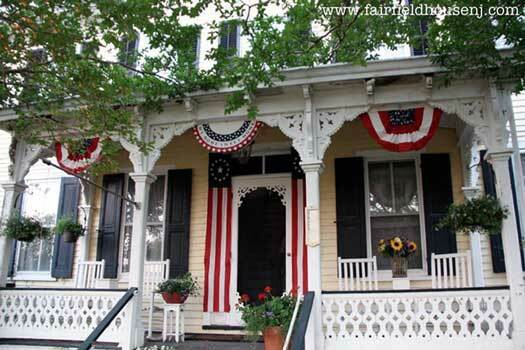 Just by draping patriotic buntings and displaying a flag, your home can be patriotic for the 4th of July. 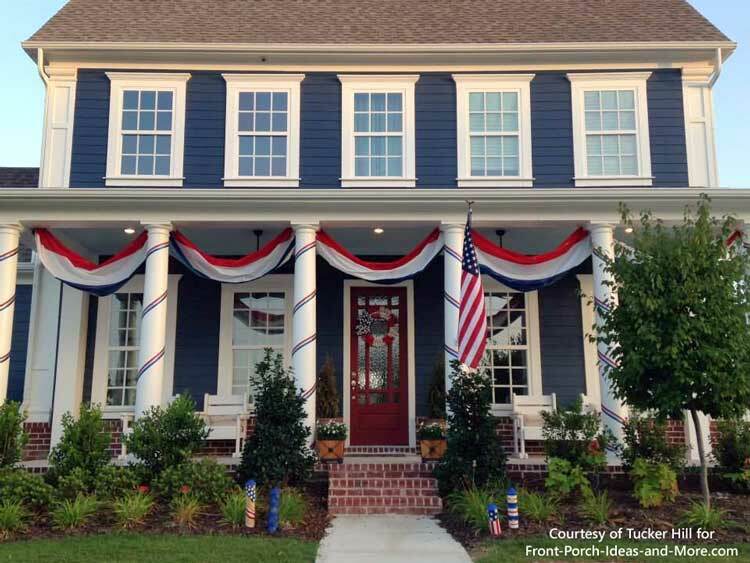 This home is all American! We love the "God Bless the USA" banner. 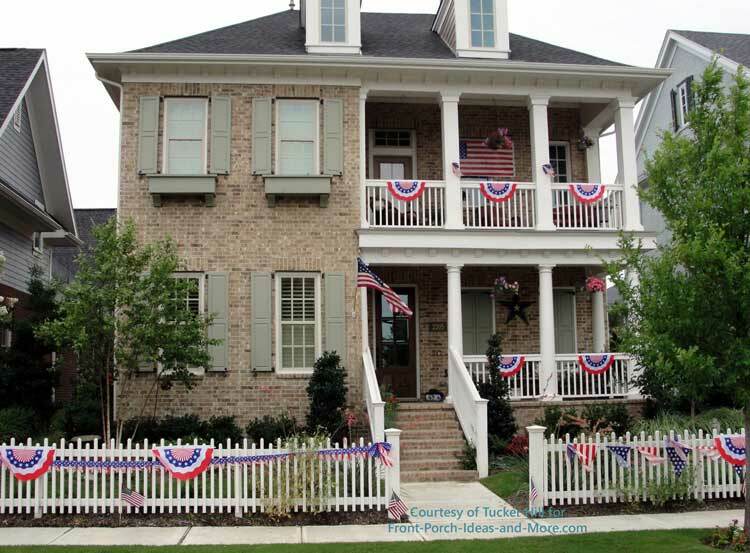 This lovely brick home not only has beautiful buntings on its porch railings, but also on its picket fence. We are most appreciative of the Tucker Hill community for sharing their pics with us! Dawn decorates her porch for the 4th! She lives in a cabin in a small town and is so good about reminding us of the importance of comfort and the goodness of old-fashioned hospitality. 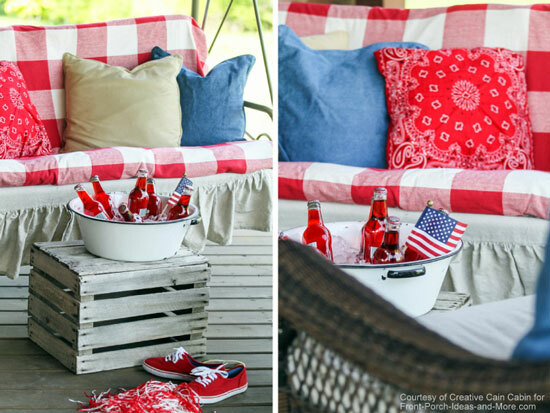 Some bold red and white checks, a bucket of ice cold red pop and comfy pillows will put you in the patriotic spirit indeed. 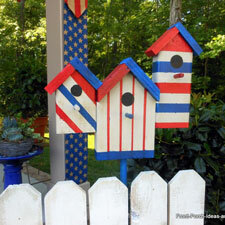 Thanks to Dawn of Creative Cain Cabin for sharing her 4th of July decorations with us. 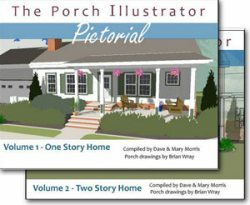 If you enjoy Dawn's patriotic decorations, I know you will also enjoy her summer porch decorated with sweet peas, her rustic autumn porch and her jewel-toned Christmas porch. 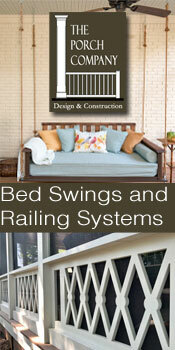 Attach banners and buntings to your balustrades (railings) like the picture shown above. If using buntings make sure the blue stripe is placed on top. 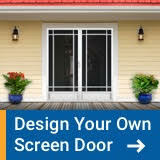 Add a patriotic doormat and some shiny red, white and blue balloons. 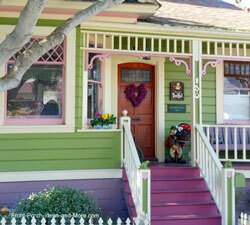 Crepe paper is inexpensive and easy to use on your porch. 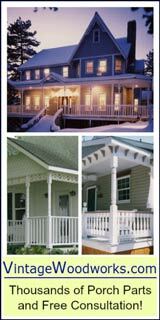 Interlace it with your balusters to create a festive look. Hang strips of red, white, and blue to symbolize the flag and let them blow in the breeze. Be careful about getting crepe paper wet, however, as the colors will run. 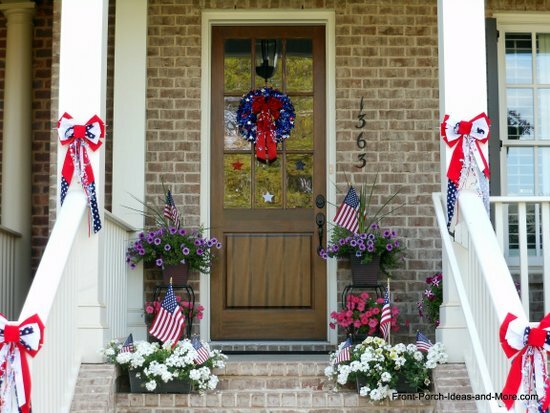 Patriotic bows on the porch steps - how easy yet so festive! 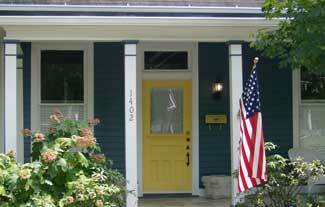 We are very proud of our Americana style porch for the 4th of July. 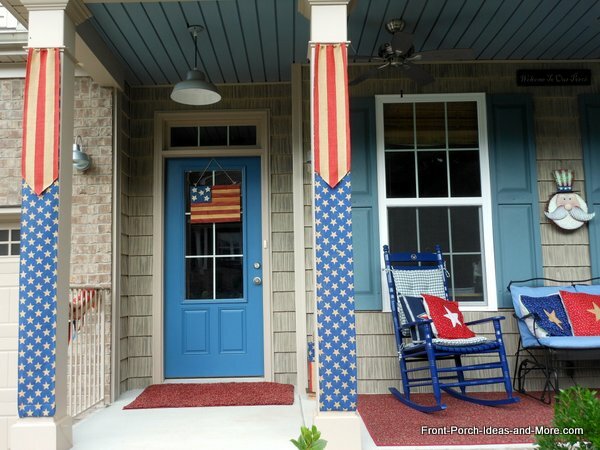 We designed our patriotic burlap banners to hang from our porch columns. 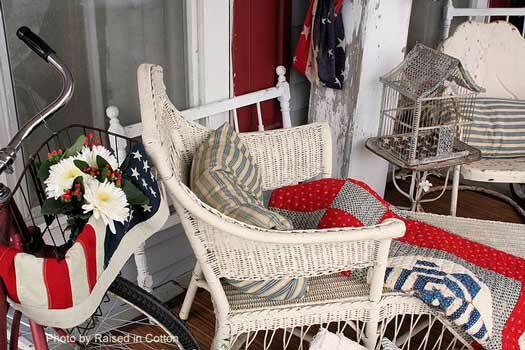 Even beautiful quilts in red, white and blue are striking and charming 4th of July decorations for your porch. 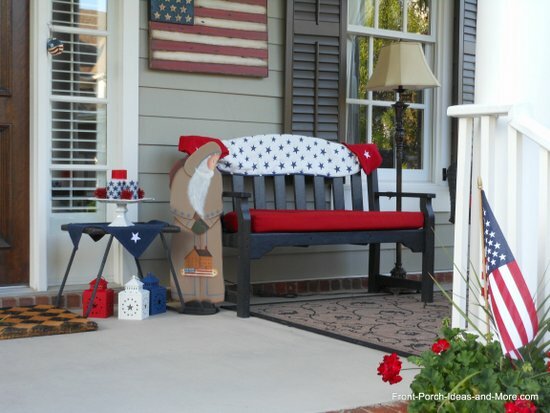 So many 4th of July touches on this porch. 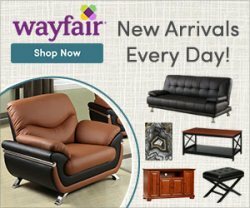 See the patriotic flag wall art? I like the small table that's decorated with candles and those red, white and blue lanterns beneath it. How about that wonderful bench? 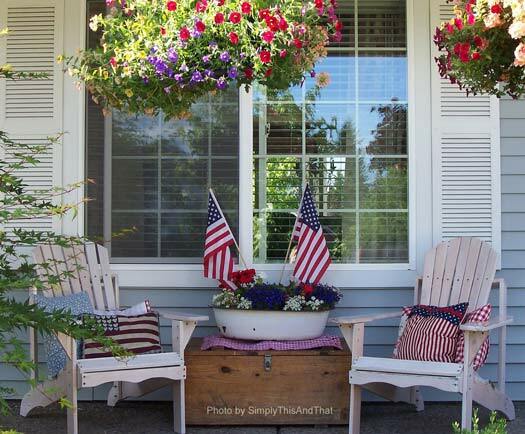 Using vibrant red, white and blue flowers, you can either landscape around your porch or create a splashing container garden for the 4th of July. You could even create a flag shaped garden with rows of red, white and blue flowers. 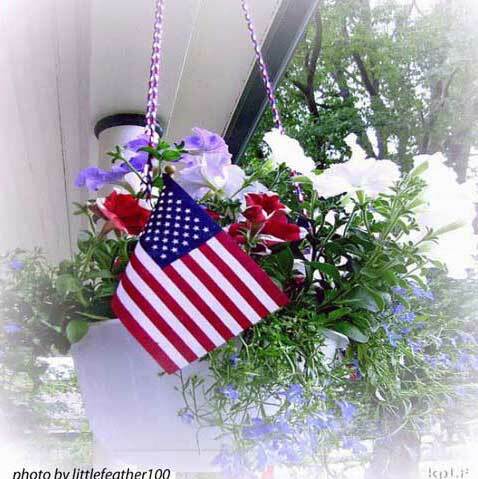 A beautiful red, white and blue hanging basket is another neat idea. 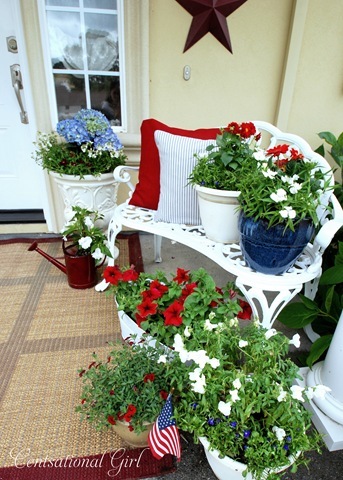 Red flower suggestions include zinnias, petunias, salvias, begonias and geraniums. 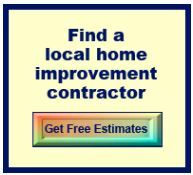 White flower suggestions are white petunias, white vinca or white impatiens. Blue flower suggestions include purplish-blue petunias, blue lobelias, blue salvias and bluebells. Let your kids help plant the flowers, too. It's fun and the flowers last all summer long. Ever think of painting your plastic pots red, white and blue? We even tell you how in our quick video. The 4th of July is all about fireworks. Create that look safely on your porch with festive lighting. Amazing the kinds of decorative lights you can get for your porch for holidays now. 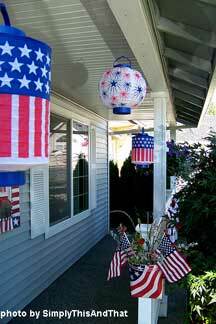 Patriotic light string kits are ideal for porches. 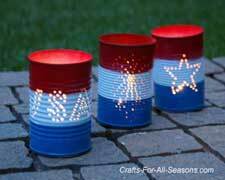 Light strings come in several styles, are safe to use, and will "light" up your porch for the 4th. 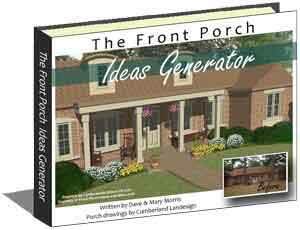 You can hang them around the top of your porch, across the railings, or down the columns. Or do all three! Flag light kits (that is, American flags made from lights) are available and will really say "Happy Birthday, America"! Dave and I found a red, white and blue string of lights at Target. 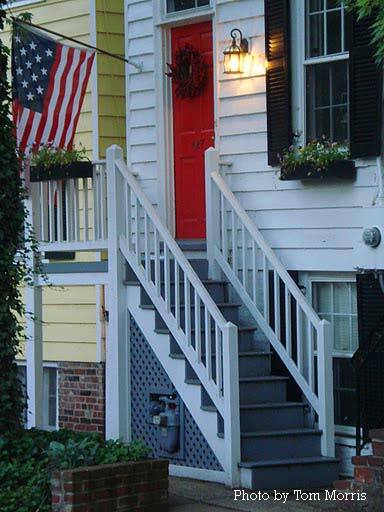 Decorate your railings and make your porch twinkle for the 4th! 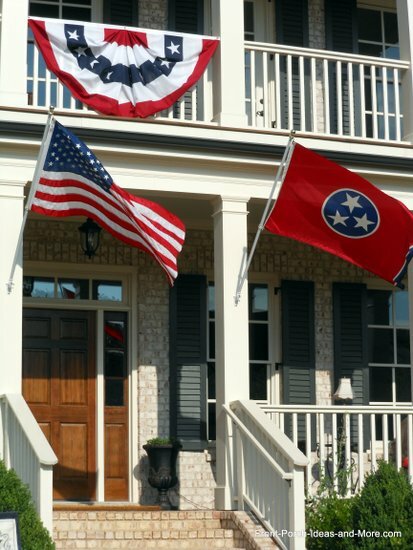 A porch is the perfect place to hang your flag and show off your 4th of July decorations. 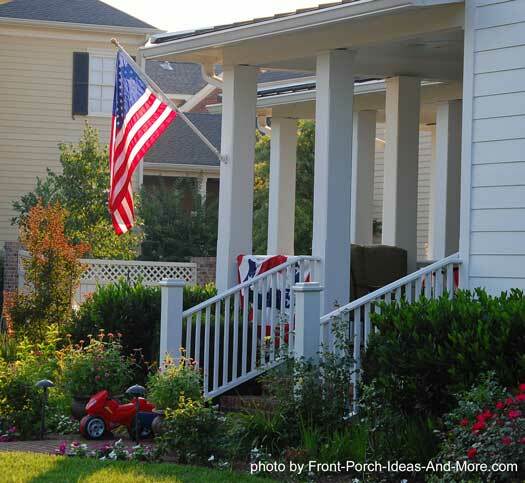 Flag holders are easy to install and nothing says patriotism better than ole Glory flying in the breeze. Just be sure the flag holder is sufficiently high enough to keep the flag from touching the ground or shrubs beneath it. 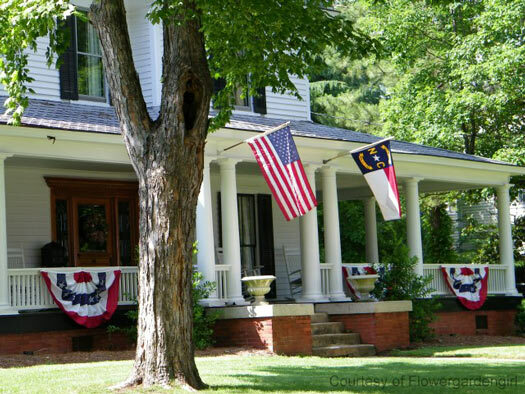 For those with screen porches, 3-season, and 4-season porches consider hanging a flag on your wall. It's colorful and will definitely be in the spirit of the holiday! A really inexpensive way to decorate with the flag is to purchase small ones at your local craft store or at the Dollar General or Dollar Tree for a dollar or less! Place them in your flower pots, attach them to your columns and railings. Or use them in a floral center piece. You can line your walkways but do not let them touch the ground. Please respect the flag and know the proper flag etiquette. Reminder: When displaying the flag outdoors, remember that U.S. code requires flags be illuminated at night. A high quality solar landscaping directional light will work but ensure it can illuminate the flag from a distance. Also, if you are displaying the flag vertically ensure the stars are in the observers top left. See all of our flag etiquette tips here. 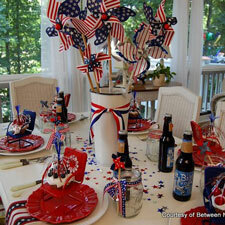 Hope you enjoyed our 4th of July decorations ideas. Want to See More Patriotic Pictures? 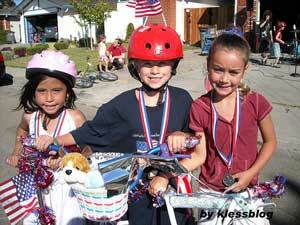 Enjoy decorating and celebrating the 4th? 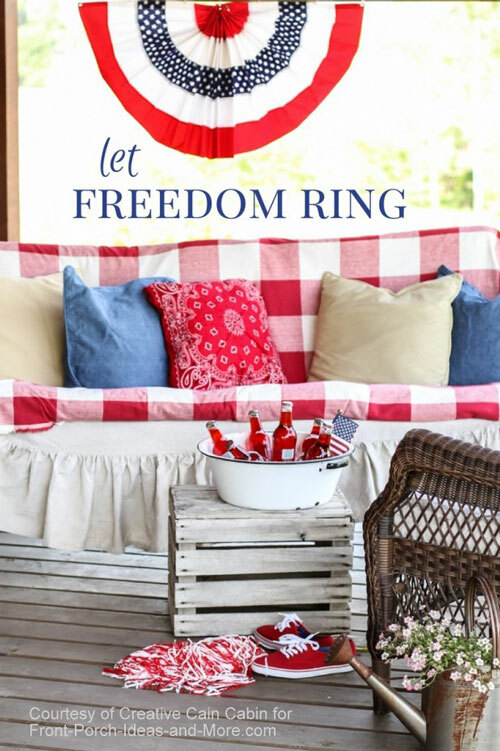 Be sure to see more patriotic ideas! 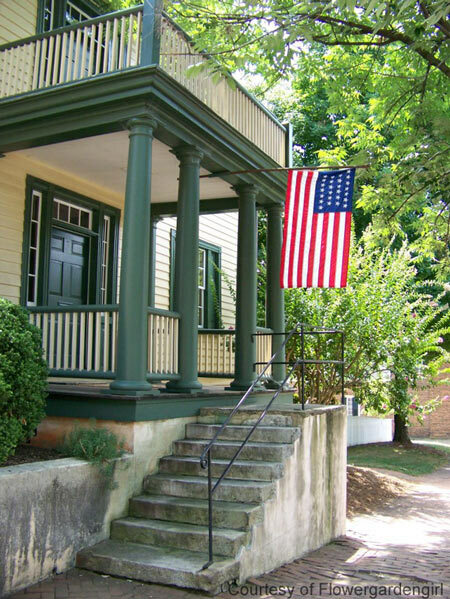 We have a bunch more patriotic pictures to show off to you - like the beautiful Fairfield House above.